VOICES exhibition returns to Galway to celebrate International Day of Persons with Disabilities in NUI Galway’s Institute for Lifecourse and Society. 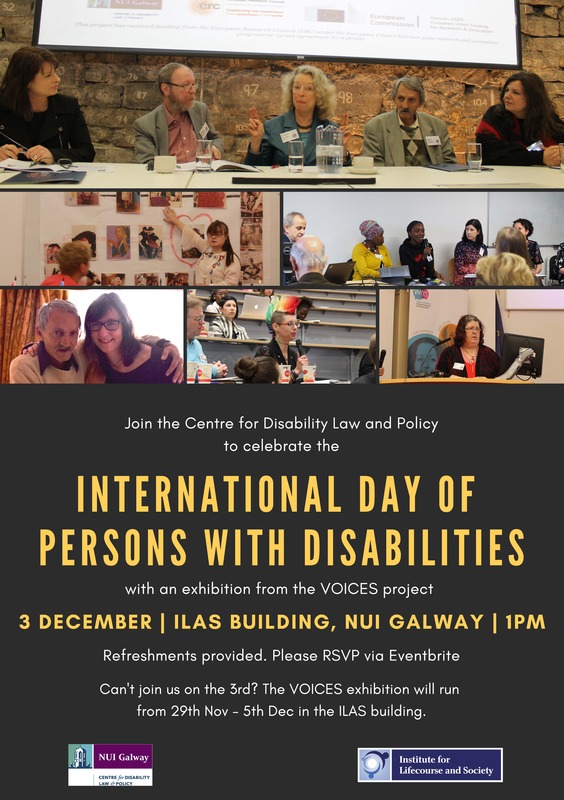 This year the Centre for Disability Law and Policy will celebrate the International Day of Persons with Disabilities with the VOICES project exhibition. The exhibition will run from the 29th November until the 5th of December in the Institute for Lifecourse and Society, NUI Galway and a special celebration of the International Day will be held on the 3rd December in the exhibition space at 1pm. The exhibition was previously displayed in the Irish Human Rights and Equality Commission in October this year to mark the completion of the VOICES project and celebrate the launch of our edited collection. It features images of each of the pairs in the project and objects representing the each chapter in the edited collection.